I think earthquakes are so cool. The 3.0 wake you from sleep rattle the walls type earthquakes, not the 10.0 knock your building over and kill all your friends kind. I know I’m totally a nerd, but I just felt a 3.0 and I’m so excited I’m blogging about it. 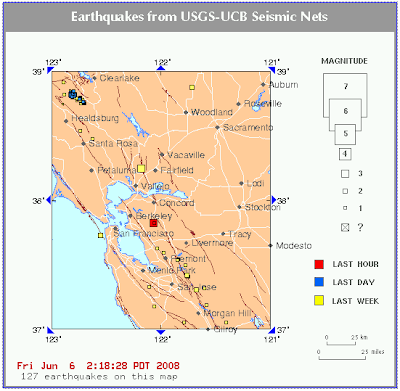 Here I was, taking a power nap on the living room floor (1:51 am) next to my computer when I awoke to the walls rattling and the ground shaking. Then, I felt another one! The second was stronger, a 3.5 (as opposed to the 3.0 several minutes earlier). So I, of course, went immediately to this website to report it (and make sure I wasn’t crazy). Anyone else in the area feel it?